Covered in multimedia lecture #1200. At 11:00 A.M., on November 11, 1918, World War I ended. The price it had exacted in lives and material was staggering: 37.5 million casualties, 8.5 million deaths, and $300 billion (not adjusted for modern inflation) in damages. People referred to a "lost generation" that never survived to come of age and take their turn in leading their nations. And indeed, the leaders of the next war, World War II, were largely from the same generation that had blundered into World War I. When the guns fell silent, there were jubilant celebrations by huge crowds expecting life to return to the normal conditions that had existed before the war. However, World War I was like a severe earthquake with devastating aftershocks, leaving the edifice of European economic and political power badly cracked and in no shape for another such jolt that might bring it tumbling down. The results of World War I were varied, far reaching, and interlocking. However, they followed five main lines of development: one of them being concerned with the effects on Europe's colonies, two concerning Western Europe (economic effects and the Treaty of Versailles), and two concerned with Eastern Europe (the Russian Revolution and the collapse of the Hapsburg and Ottoman Empires). World War I had been extremely expensive for the European powers. As a result, they sold many of their colonial mines and plantations for the cash needed to fight the war. This weakened Europe's colonial empires and set the stage for eventual liberation after the next big jolt to Europe's power: World War II. was affected in two ways: the peace settlement and the economic cost of the war. First, there was the question of what sort of peace to impose on Germany. Among the leaders at the peace conference held at Versailles was President Woodrow Wilson of the United States, whose presence symbolized America's growing role as a major power in world politics. Wilson, whose country had suffered little from the war, wanted leniency for Germany along with national self-determination for all nations and a League of Nations to safeguard the international peace. However, many leaders had to justify the senseless carnage of the past four years to voters back home who wanted revenge for their sufferings of the past four years. This was especially true for France, on whose soil the war had been fought. Therefore, amid much bickering that settled nothing, the prevailing attitude that emerged was that someone must be made the scapegoat and pay for the war. And that someone was Germany. The resulting Treaty of Versailles (1919) punished Germany materially and politically. Germany lost 13.1% of its pre-war territory, including Alsace, Lorraine, and the so-called Polish Corridor, a strip of land separating East Prussia from the rest of Germany. Its army was limited to 100,000 men and its navy to twelve ships. (The Germans scuttled their fleet rather than let it fall into British hands.) Germany could have no submarines, air force, heavy artillery, tanks, or even a professional general staff. It lost most of its merchant marine, one-quarter of its fishing fleet and a good part of its railroad rolling stock. Each year it had to build 200,000 tons of shipping for the victorious allies and also make deliveries of other commodities such as coal and telephone poles. The final indemnity forced from Germany amounted to $32 billion (not adjusted for inflation). 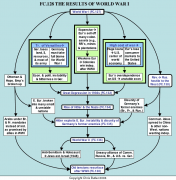 Germany also had to agree to the War Guilt Clause, according to which it accepted full responsibility for the war. The German people were furious but, for the time being, helpless to do anything but sign the treaty. However, the Treaty of Versailles remained fixed in German minds as an injustice that must be avenged, especially since it destabilized their economy and helped lead to the Great Depression in the 1930's. This in turn opened the way for the rise of Hitler and the Nazis who started World War II. Economically, World War I had been horribly expensive, both in its immediate cost to fight and its long-range effects on Europe's industries. In addition to selling colonial holdings, the allies had resorted to borrowing heavily, especially from the United States. By the war's end, European countries owed the United States $7 billion. By 1922, it would be $11.6 billion. Thanks largely to World War I, the center of world finance was shifting from London to New York City. However, the economic effects of the war went far beyond borrowing money. For four years, European countries had been producing guns and ammunition instead of consumer goods. This had allowed other countries, the United States in particular, to take over many consumer markets from the Europeans who were preoccupied with the war. Not surprisingly, the Americans did not willingly give up these markets to the Europeans after the war. Because of this and the huge war debts, the United States became the premier economic power of the world, creating a heavy dependency on the American economy. This, combined with German instability, made the world economy vulnerable to a worldwide depression when the American economy crashed in the 1930's. And, as discussed above, that would help lead to the rise of the Nazis and World War II. World War I also catalyzed the Russian Revolution along with the collapse of Austria-Hungary and the Ottoman Empire in South-eastern Europe. In each case, these events would destabilize their respective regions and lead to future conflicts. The break-ups of the Ottoman and Hapsburg Empires created problems in two ways. In accordance with the principle of national self-determination, the Hapsburg Empire was broken up into four new democratic nation states: Austria, Hungary, Czechoslovakia, and Yugoslavia, while Poland, Latvia, Lithuania, Estonia, and Finland were formed from parts of the old Czarist empire. In addition there were still the various Balkan states whose squabbles had triggered World War I in the first place. While democratic in form, these new nations generally had little economic strength or history of democracy (both requiring a healthy middle class) on which to base strong democracies. Therefore, Eastern Europe was a patchwork of unstable states, providing Hitler ample opportunity for aggression that would start the Second World War. This instability along with World War II also provided fertile ground for growing anti-Semitic feelings that caused growing numbers of Jews to move to Palestine. The break-up of the Ottoman Empire also profoundly affected the present day situation in the Middle East. The Arabs, instead of gaining their freedom for helping the allies against the Turks, as they were led to believe would happen, passed under French and British control as mandates to be prepared for independence in the future. This created a good deal of bitterness, made worse by the Balfour Declaration (1917) which had promised the Jews a homeland in Palestine for helping the allied cause. The influx of Jewish settlers into Palestine after Nazi persecution during World War II only made that bitterness worse in the Cold War period following the defeat of Germany. The Russian Revolution which replaced a corrupt Czarist Russia with a strong communist state, the Soviet Union, created problems in two ways. First, the hostility it generated between itself and the capitalist democracies of the West undermined any joint efforts to contain future German aggression. With the old Triple Entente threatening Germany from east and west broken, Hitler could feel freer to expand eastward in the 1930's, thus providing another catalyst for the Second World War. World War II would eventually cause a reunion of the old alliance of Russia and the West to crush the Nazis. However, it was an uneasy alliance that would come apart in the Cold War after 1945. The Russian Revolution would also lead to the spread of communism to China and other non-industrialized nations, contributing still further to the tensions of the Cold War. As the 1920's progressed, the world seemed to be settling down to the normalcy longed for so much since 1914. Russia withdrew into itself to complete its revolution. Germany, propped up by American loans, seemed to have stabilized. And Europe overall seemed to have recovered its prosperity and maintained control of its colonies. However, World War I unleashed unseen forces that would surface with cataclysmic effect to trigger a worldwide depression and World War II.